Suzuki GSX-R Motorcycle Forums Gixxer.com > Gixxer Forums > Oil Cooled Gixxers > Understanding Carbs, Rebuilding Forks and 1100 Shocks! Understanding Carbs, Rebuilding Forks and 1100 Shocks! After seeing about 50% of new threads be about carb problems ive been thinking about compiling a bunch of information on our carbs so people can better understand how they work, plus how to fix/tune them. Anyone think this would be a good idea? I think i have a very good understanding of carbs and Im willing to put in some work if enough people are interested, and im hoping others will contribute. Any and all feedback would be great. Awesome troubleshooting tips too on the mikuni's that can even be put to use when installing and/or tweaking a jetkit or when you move from the mountains to sea-level and vice versa. Some old-school racing bike books you find in the library from the early 80's can help some, but that GS500/GS500e book was really descriptive and had awesome (to scale, no less) graphics and charts for fuel mapping. If you can find something like that, scan it and do an image-to-text it would really help out some people. The english was odd at times, but it really had more information than I've ever seen in any book. Learned allot from it. Last edited by shadowspawn; 06-15-2007 at 11:01 AM. Last edited by Old Skool_R; 07-04-2007 at 09:09 PM. acampinoob found this carb guide so i am posting the link in this sticky. 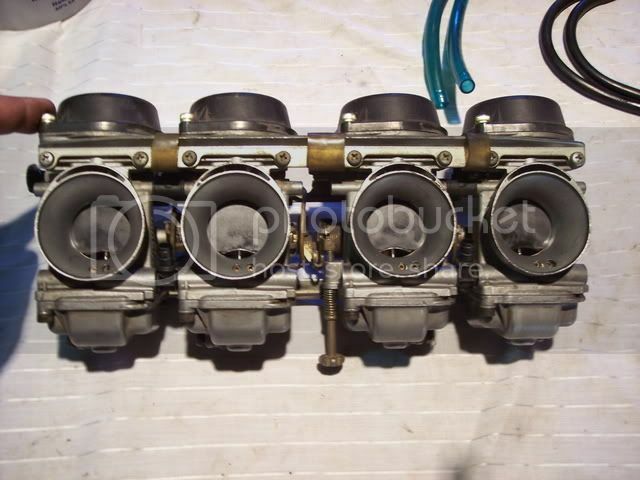 Ok, so heres my guide on how to clean your Mikuni BST36SS carburetors a.ka Slingshot carbs. 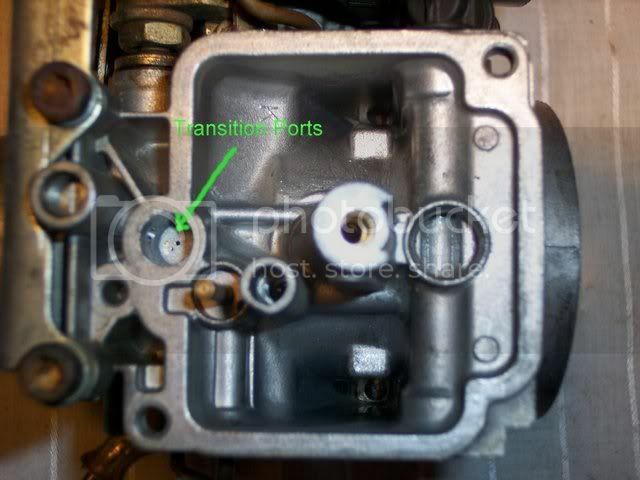 This guide is written assuming you already have the carburetors removed from your bike. Make sure you have a very clean workspace and have a box of ziplock bags on hand so when you remove parts from the carb you can place them in a bag and label them. You should have one bag for each carb, and all the parts from the carb you're working on should stay in one bag, DO NOT mix them up. This is so that when you are all done re-assembling you carbs there are no extra bolts left over and you wont have to wonder..."where does this go again?" Everything needs to be clean, clean, clean. I cannot stress this enough. If the carbs are dirty on the outside when you take them off, spray them down with degreaser or some gentle parts cleaner. 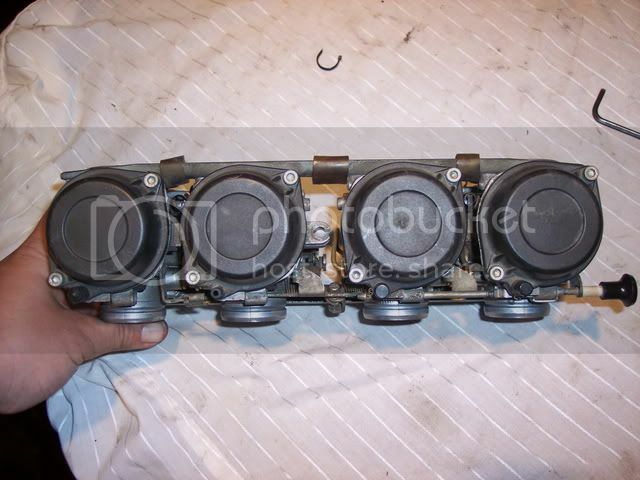 When you re-assemble the carbs make sure every part is extra clean, you dont want to be doing this over and over. Make sure your tools are clean too. Ive caught myself picking up a screwdriver that had dirt and metal shavings on the end of it when i needed to put a main jet in. NOT GOOD! Fuel delivery system- (gas tank, petcock, fuel filters, and fuel line). All of these components of the fuel system need to be clean and in top shape or the bike will never run right. Sometimes its not even a carb problem, its a fuel problem. Check the tank to see if its rusty. If it is, either get a new tank or you can get the tank acid dipped to get most of the rust out. Some people use tank coatings like Kreem or Red-Kote. I know some have used it with good results but i think its just putting a band-aid on a broken elbow and might end up causing more problems than fixing. If the tank is rusty and you dont want to get a new tank or re-paint the one you have after getting it dipped id just try to clean it the best you can. The filters will catch the very small stuff, you just dont want so much rust that the filters get clogged. To clean the tank, empty out all of the gas and wash the small amount of remaining gas out with water. Remove the petcock and cover the hole with duct tape. Put an assortment of nuts, bolts, small chain, etc. into the tank and shake it back and forth, up and down, side to side to get any loose rust off of the inside of the tank. Now take the duct tape off, open the filler door and wash the loose rust out with water. Wash it a couple times to make sure you got it all. A garden hose works best. Allow the tank to dry so no water gets mixed with the new gas. Blowing compressed air into the tank will help speed up the drying process. Before you put the petcock back on, check the screen. If it is ripped, clogged or missing, replace the petcock. If the petcock is in good shape, re-install it and set the tank aside until you are finished with the carbs. 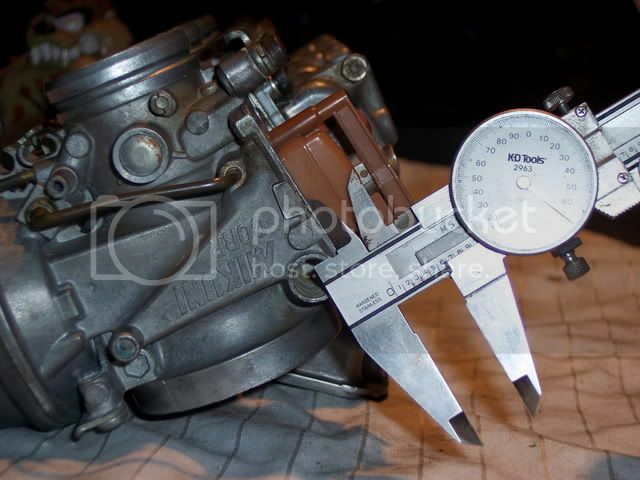 Another thing you should check while the carbs are off is the intake boots and clamps. Check for dry cracking/rotting/checking, rips, slices, gouges, etc. in the boots. Also check to make sure that the bolts that hold the boots to the motor are tight. If any air is leaking by the carbs into the motor it will not run right and you will be chasing your tail trying to tune the carbs with an intake leak. I know some GSX-R's have the synchronzing ports on the intake boots, make sure these are blocked off and not leaking also. Same thing with the clamps, make sure they're in good shape. If they aernt get new ones and dont use a hose clamp! the hose clamp will cut into the intake boot and could cause a leak. -Wide assortment of screwdrivers, regular and phillips head. -Carb cleaner( both solvent and a can of cleaner with extension tip) or Carb cleaner "dip"
First thing to do is remove the vent lines and fuel lines, this will make it easier to work on. I like to remove the big center idle adjustment screw also because then the carbs will stand up by themselves but some people may not want to. Next thing you will want to do while the carbs are still sealed is take the pilot screw plugs out. (Refer to the pic for location) Underneath these plugs are the pilot screws or a.k.a idle screws. When you hear people talk about drilling out the idle screw plugs when they install a jet kit, this is what theyre talking about. 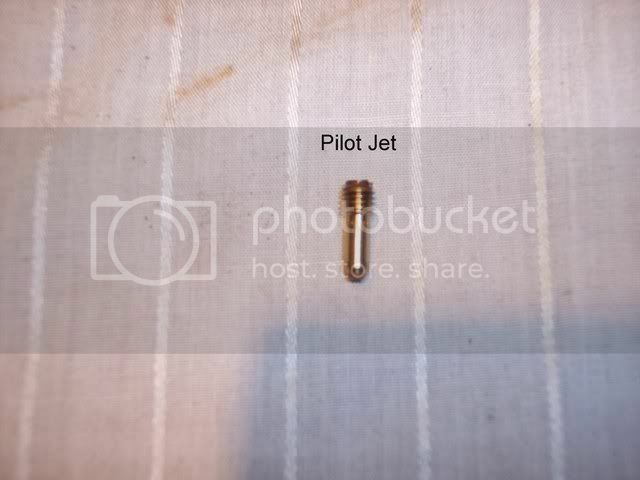 Well, whether you have a jet kit or not, i reccomend taking the plugs out so that you can take the pilot screw out and inspect it. This will also let you to clean out the idle circuit. You will want to use a drill bit that is a couple sizes smaller than the plug. 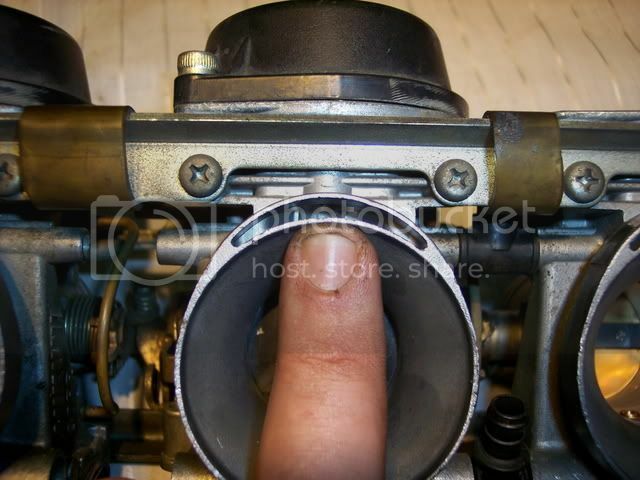 This way if you aernt holding the drill perfectly straight you wont drill into the carb body. Best thing to use is a drill press where you can control the feed but a hand held electric drill will work just as well if you are careful. Drill the plug out LIGHTLY, if you use too much pressure you will break thru the plug and drill the head of the pilot screw. NOT GOOD! Once you feel the drill bit break thru the plug, STOP and remove the drill. Sometimes the plug will come out with the drill bit. If it doesnt, get a flat tip screwdriver that fits halfway into the plug and while pushing down lightly, twist the screwdriver back and forth. 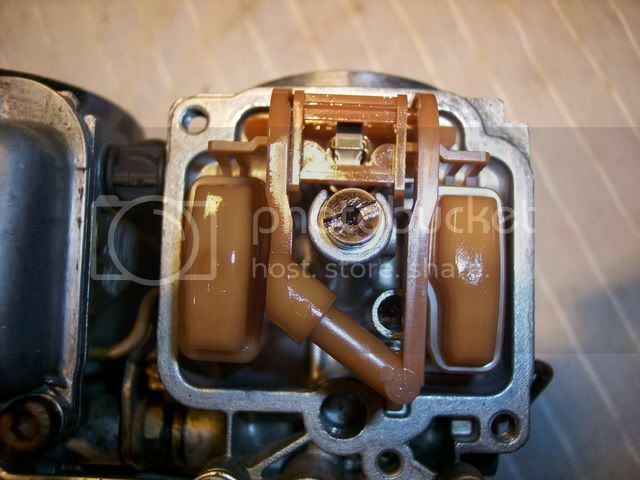 The plug should come unseated from the carb and come right out. Repeat this on the remaining 3 carbs. After all plugs are out, use compressed air to blow all the shaving off of the carbs. *You should use both hands to pick up the diagphram. I only used one hand because i had to use the other to run the camera. Next is to remove the float bowls*. 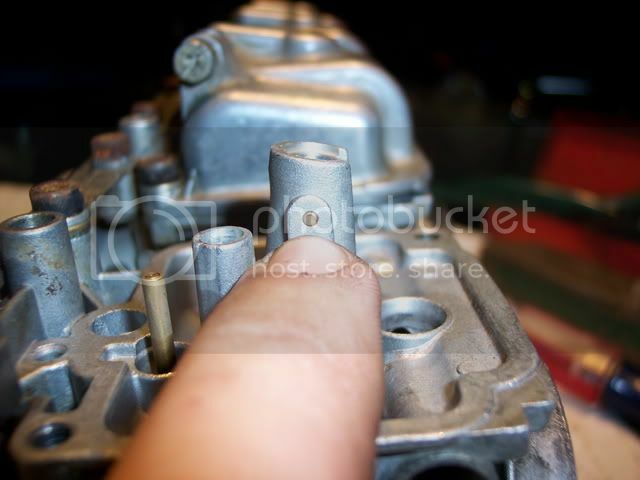 Make sure to remeber which way the float drain screw is facing on each carb before you take them off. Now, remove the needle/float assembly. Gently pry under the tab near the needle with a small screwdriver while pulling up on the other side. Once it is out check the two o-rings to see what shape they are in. I highly reccomend replacing these now. You already have them apart and if they do leak the bike will not run right. Another thing to check is if the needle and seat are working good. Clean off the fuel inlet part of the float good so there is no gas. Then blow thru the inlet with your mouth and manually work the float by hand. You should be able to blow thru it fine with the float all the way down. You should not be able to blow thru it with the float all the way up. If you feel air leaking by with the float all the way up, the float assembly is no good and needs to be replaced. Another thing to look for with the float assmebly (this is rarer with plastic floats but ill mention it anyways). 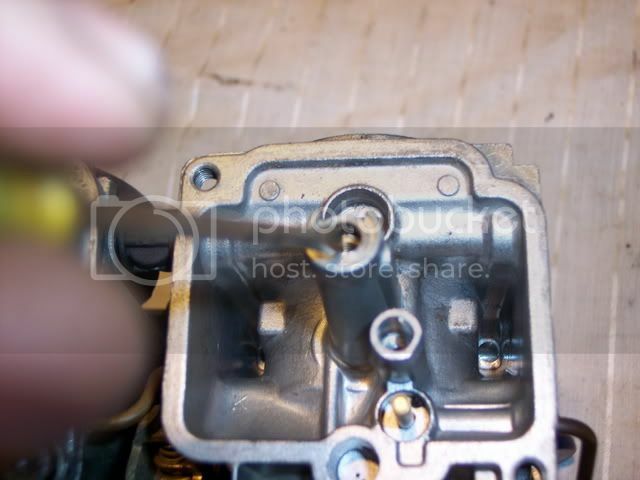 If you have one cylinder that keeps getting flooded and the needle and seat and o-rings are good, the float may have a hole in it. What happens is gas will leak into the hollow float and the float will not float anymore (haha) which will cause the needle to stay open and let fuel in all the time. Hold the float assembly up to a bright light and you should be able to see gas inside the float. Another good check is to hold the float under water and see if any air bubbles come out. You cannot replace the needle and seat or float by themselves. It comes as one assembly. If the float assembly is in good shape, bag it. JackCélaire, ozcru and kiwisuzuki1100 like this. Last edited by Old Skool_R; 09-07-2007 at 07:38 PM. 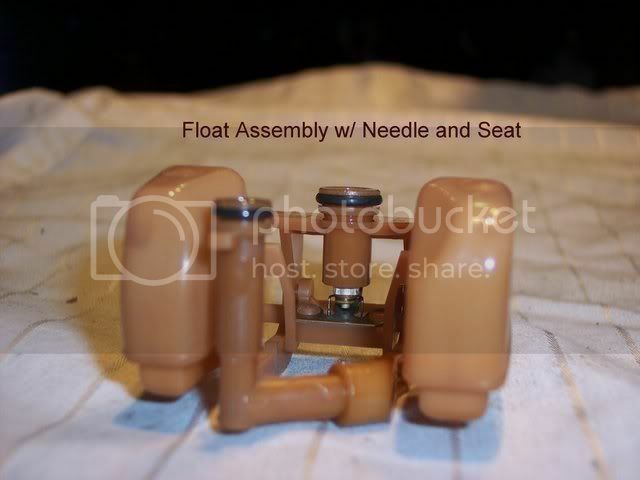 NOTE: The plastic float assembly is a 2 piece design, if youre careful you can take the center section out to see if there is anything getting caught between the needle and the seat. Ive saved a couple float assemblys this way. I would only do this if you tried blowing thru it and it did not seal. WARNING: You might break the float if you attempt this, but if its not sealing good, you need a new one anyways. YOUVE BEEN WARNED. Dont try bending the float when its cold, let it sit in the sun for a while before you try this. Refer to the picture i have of the float assembly, if you pry the two sides out with your fingers and push the center part out youll be able to take the needle out. *You can see in the pics ive replaced them with socket cap screws, the stock screws have a phillips head. I highly reccomend replacing all of the phillips head screws on the carbs with socket caps. Especially if you have a jet kit because the heads will strip out after many uses. 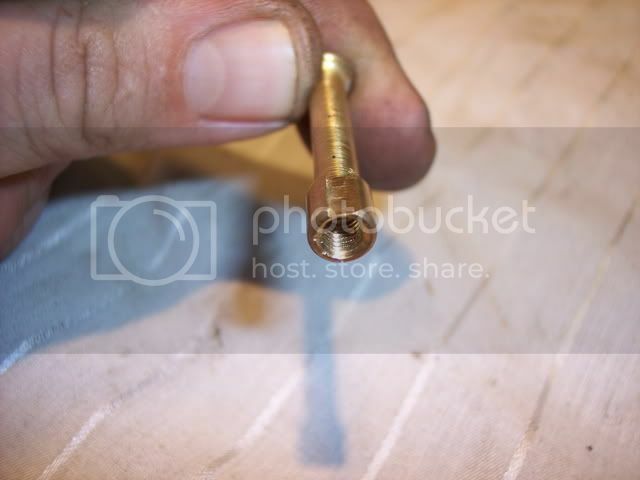 The screw size is 8 x 1.25mm. Your local Home Depot or hardware store should have these. Try to get stainless, its more expensive but it looks better and wont rust. Last edited by Old Skool_R; 09-23-2007 at 04:07 PM. Next, remove the main jet with a good size flat screwdriver and start a seperate bag for just jets. These will be getting soaked and cleaned later. Now remove the emulsion tube which is right under the main jet. In the pics you can see i used a small flat screwdriver to knock it out. This is all i had at the time. Best thing to use (thanks FastCat for info) is a long 5mm bolt/screw. It will screw right into the emulsion tube and you can push/tap the emulsion tube out. This way you wont marr the soft threads of the tube if you plan on using them over again. If you know youre going to put new tubes in anyways, just use whatever works. When the tubes come out the plastic slide guide that holds the slide in place usually comes with it. This is fine, just notice that there is a o-ring on the bottom (see pic). Sometimes it stays on the guide, sometimes it stays on the carb itself. Whichever, push the emulsion tube up and out of the plastic body (you may have to wiggle it out). Put the guide in a bag and put the emulsion tube in your jets bag*. Next remove the pilot jet, it is right next to the main jet tower. Put this in your jets bag. 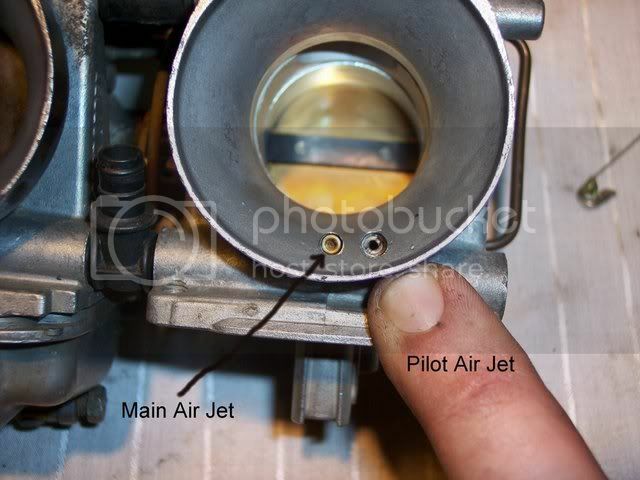 Now remove the pilot air jet, located at the mouth of the carbs (see pic) put in the jets bag. The main air jet is pressed into the carb body and is not removable. At least the ones i have aernt. 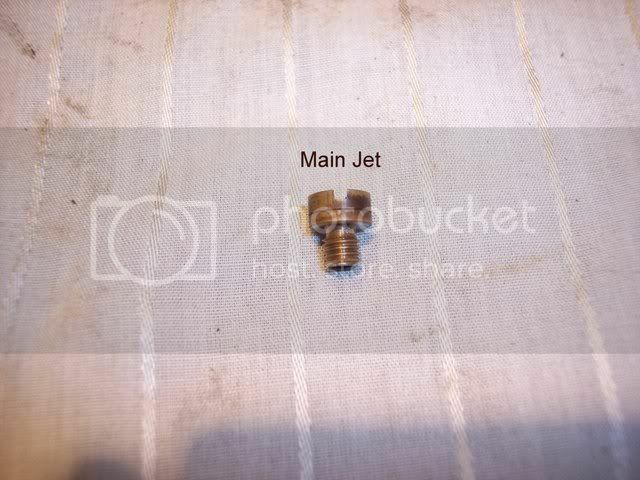 Do not attempt to remove this jet, just spray carb cleaner through it and blow it out. 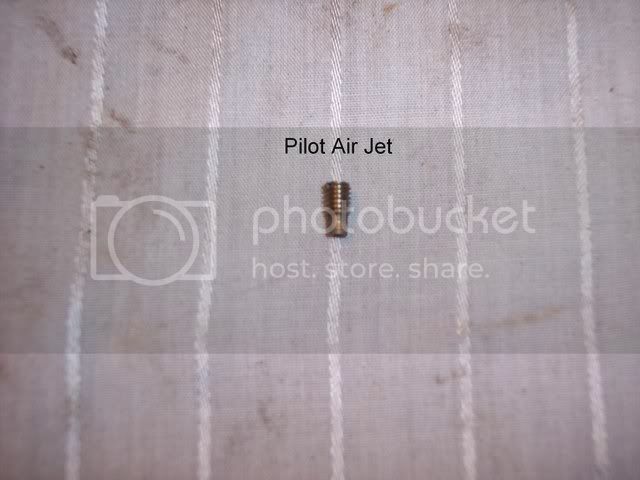 Last but not least, is the pilot screw. Underneath the screw is a spring and o-ring (by what ive been told there should be a small washer between the spring and o-ring to protect the o-ring from being ripped. I did not see these on my carbs, but keep a good eye out for the washer when you take everything out!) A small safety pin with a bent end on it will help you get both out. Be careful not to puncture the o-ring with your pick. Continue to disassemble the last 3 carbs in the same way. Last edited by Old Skool_R; 09-23-2007 at 04:19 PM. Note: Most carb solvents like this are acid based and will eat plastic and rubber, make sure you look on the back of the carb cleaner to see if it's safe for plastic/rubber parts. If the dip is not plastic safe you will have to completly disassemble the rack of carbs and remove the rubber vent barbs and the rubber fuel inlet barbs. If your carbs are in very bad shape this is the route i reccomend. If you're a beginner and your carbs are in need of a full disassembly in order to soak them, please take them to a professional. Other than that, a can of spray carb cleaner will work fine. 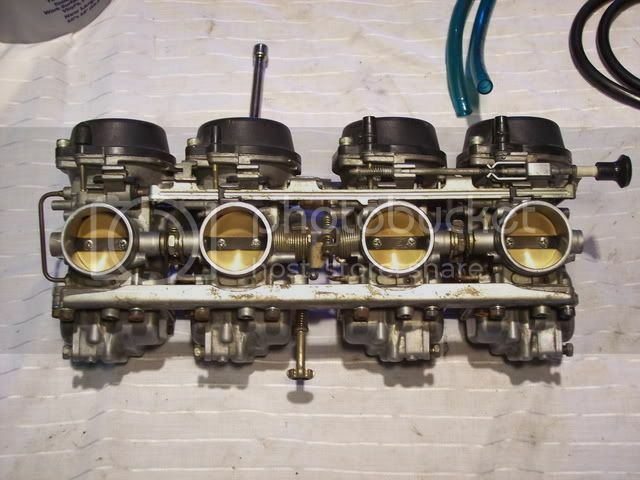 Now that the carbs are completly disassembled you will need to make sure that the insides of the carbs and all the fuel/air circuits are clean from dirt, varnish, sediment, or any other foreign objects. You can do this by one of two ways. One way is to go to the local auto store and buy some carb cleaner "dip" to soak the carbs in. This dip usually comes in a 5 gallon or more can. Pretty much just open the can and set the carbs in, let them soak until all the nasty gunk is gone. If using the spray carb cleaner, if there is any gunk inside of the float bowls or the inside of the carbs this should be cleaned out first. Spray some carb cleaner on the gunk to loosen it up and then use whatever cleaning tools you have to remove it. 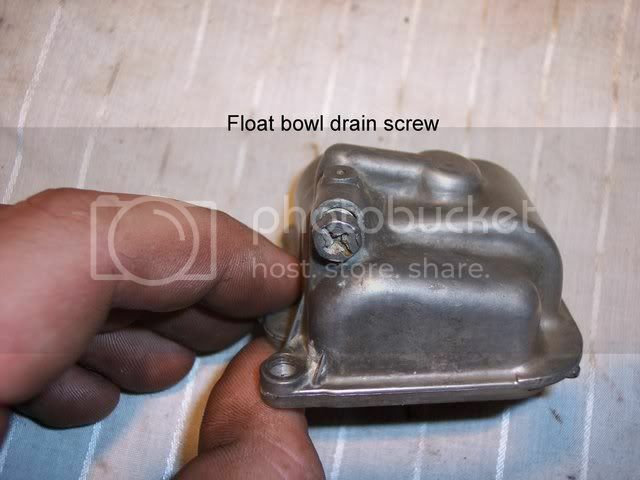 The inside of the carbs/float bowls should be very clean. Take as much time as you need to get them perfect. Next, take your can of carb cleaner with the nozzle extension and spray cleaner into every hole/circuit that you can find. Some of the circuits that you might not see that need to be cleaned are right by the throttle plate. These are called transition ports. Start by spraying some cleaner into whatever circuit you are trying to clean, let it soak for a second and then blow some compressed air in to try and clean it out. If its clean you will hear/feel air coming out of the other side of the circuit. This will let you know that circuit is clean. If you do not feel any air coming out, that circuit might be plugged. Try cleaning it with some more carb clean and blowing it out a couple more times. If none of this helps you will have to find a small piece of wire to stick in to break up whatever is blocking it. If you have a good supply of compressed air you should rarely have to resort to using the wire trick. Repeat these steps on every other hole/circuit you find. Now that the carbs are done, you can clean out the jets that you put aside. If you put the jets up to a light and look thru them you can tell if theyre blocked or not. If theyre really dirty you can soak these in the carb dip without any worry. If they look to be in decent shape, give them a quick look under a magnifying glass to see if there is any varnish build up on the inside of the jet. If it looks clean, or there is a small amount of varnish/gunk, give it a quick spray with the cleaner and blow it out with the compressed air. If youre emulsion tubes are in good shape and youve decided to use them over, look in all of the air holes to see if theyre plugged. Again, holding the tube up to a bright light will let you see if these small holes are blocked. If they are, use your torch cleaning tips to clean them. Do not force any kind of tip or pick into the hole, as you might enlarge it. Last edited by Old Skool_R; 09-03-2007 at 07:16 PM. 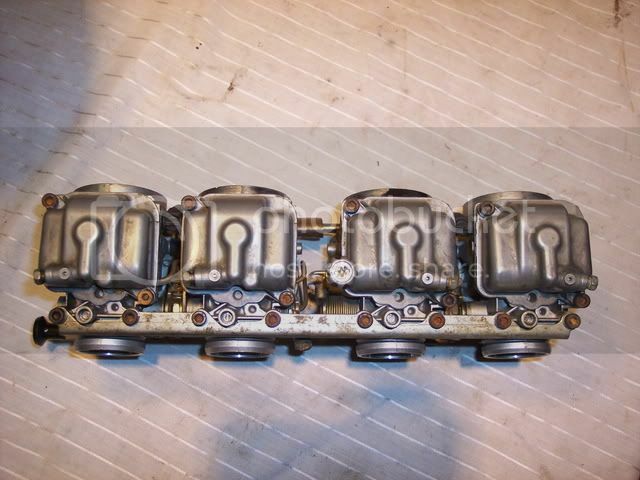 Now that all the carbs and jets are clean, you can put them all back together. Its pretty much the reverse of taking it apart but theres some things to know. *When putting the vaccum caps or float bowls back on i would reccomend replacing the phillips head screws with socket cap screws, especially if you're putting a jet kit in. 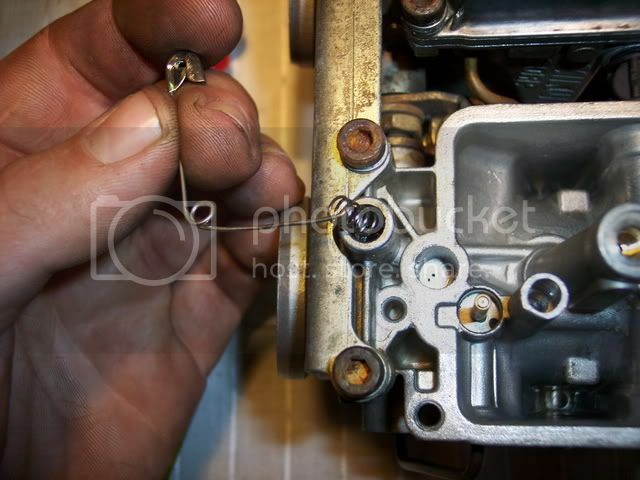 If you have the carbs apart multiple times to change the settings, the head of the screw usually strips out. The size of the screw to replace them is 8mm x 1.25. Go to your local hardware store and get some stainless steel screws and lock washers. If all they have is regular steel thats ok, but they will rust as you can see mine did in the pics. You should only need lock washers for the float bowls. Remeber to take the screw with you so you can get the correct length. 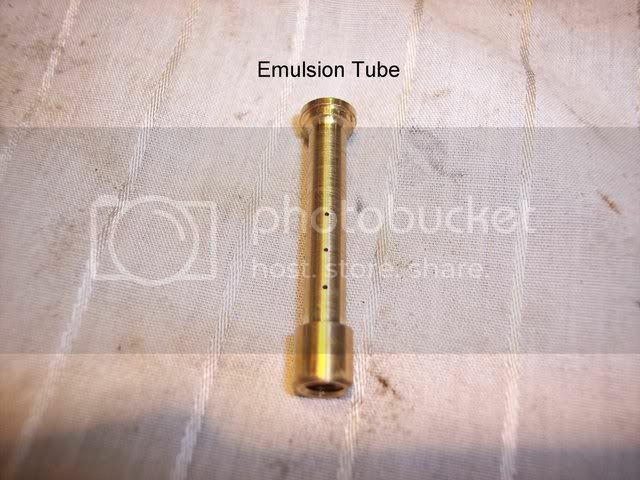 Plastic guide/Emulsion tubes - When putting the emulsion tubes back in, there is only one way they can go back in. If you look at the bottom of the tube ( in the pictures )you can see a slot. 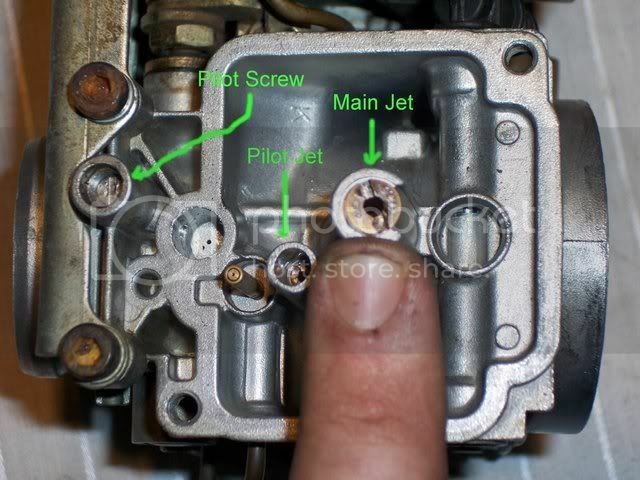 Now look at the main jet tower on the carb, see that pin? ( Im pointing to it in the pics ) This is where the slot in the tube needs to line up. If the tube doesnt go in easily (might have to lightly tap them in) then the tube is probably not lined up right. 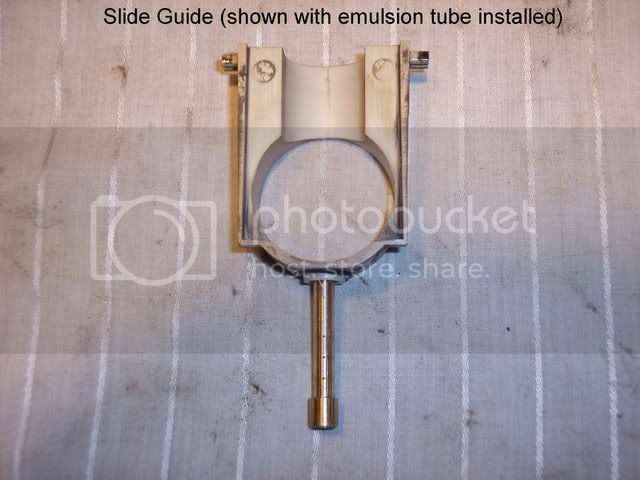 Make sure when installing the slide guide block the o-ring is centered and not off to one side. 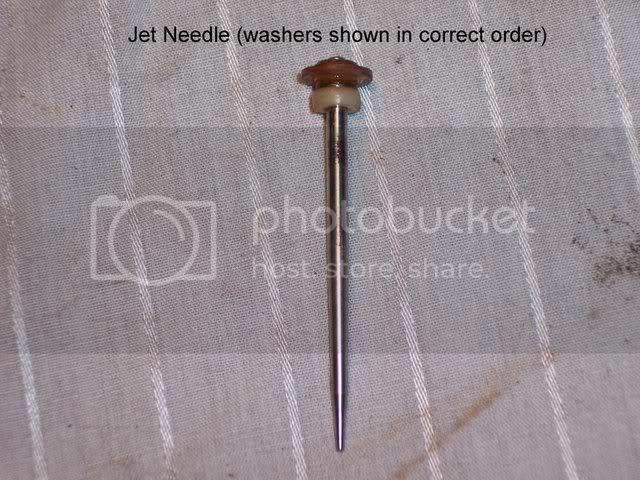 Needle/Slide/Diaphram assembly - The needle and washers go in the order shown in the picture, the white washer that goes on bottom has two notches cut into it. These notches face down. 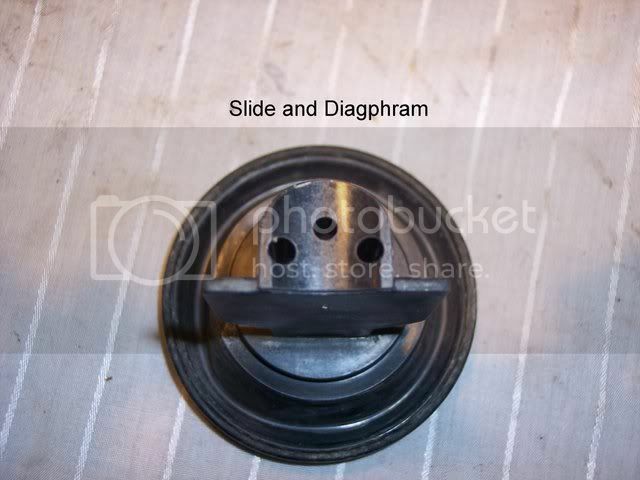 Vaccum caps and slide springs - Make sure the o-rings are in place before you install the vaccum cap. If not there will be a vaccum leak and the bike will not run right. 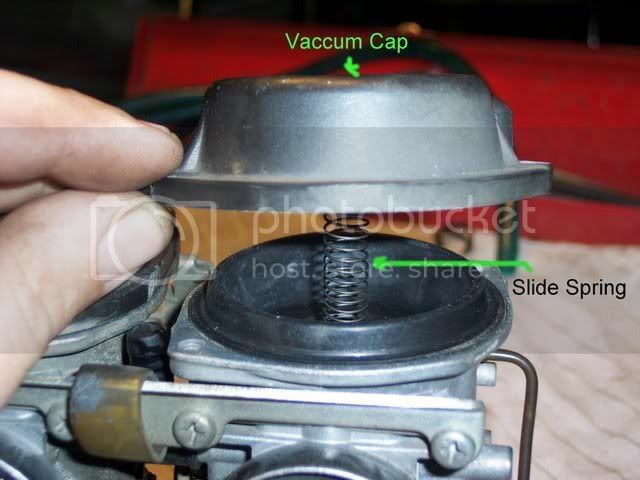 When installing the vaccum cap, put the slide spring onto the tower in the cap and then lower both onto the carb. 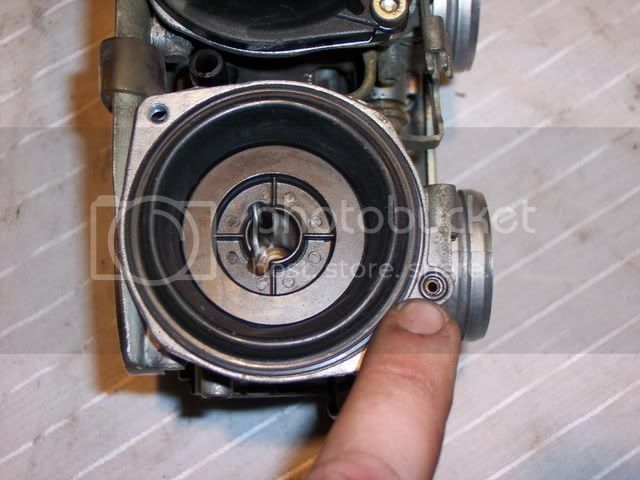 If you put the spring in the carb first and then lower the cap onto the spring, it might not seat correctly and may come off the tower. After you have all the caps on, manually work the slide with your finger, it should slide up and down with some resistance. If it slides up easily, or doesnt feel right, the spring may have popped off the cap. Take the cap off again and double check everything. 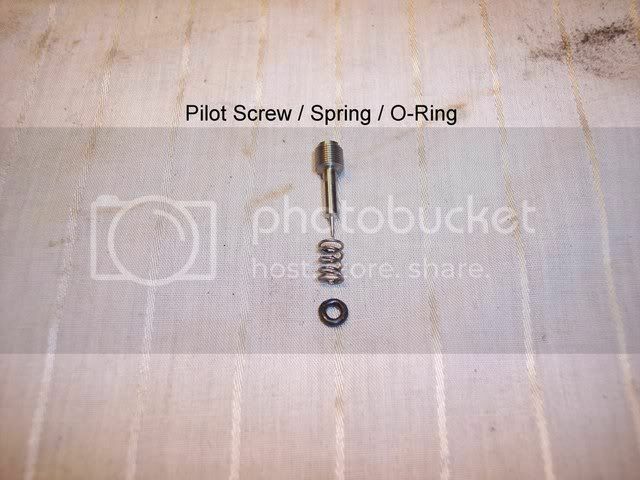 Pilot screws/Jets - As you can see in the pic, the o-ring goes first, then spring, then the screw. Screw the pilot screw in until you feel it bottom out on the carb. 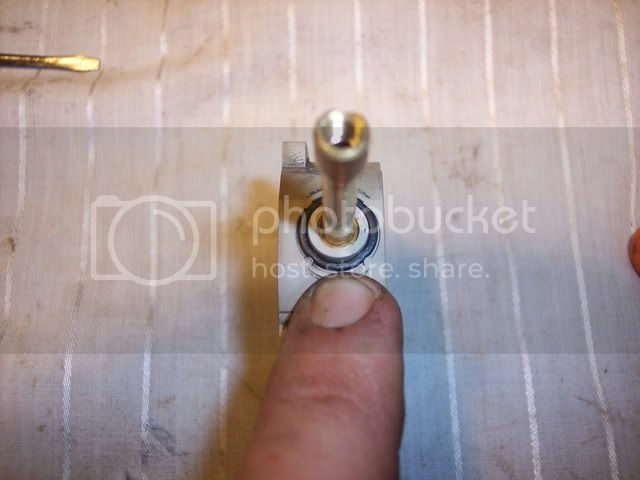 Do not tighten the pilot screw anymore after it has bottomed out! You may damage the screw or could damage the carb. Now back the screw out however many turns that are factory reccomended. If you have added a performance exhaust or air filter you may need to turn the screw out farther to richen up the idle mixture. 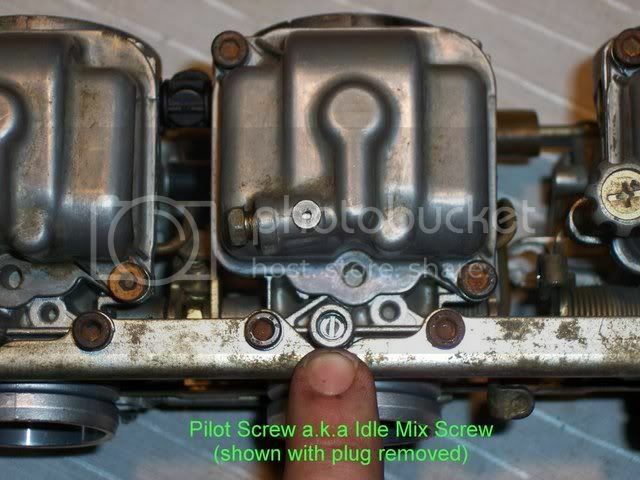 The more you back out the pilot screw (counter-clockwise) the richer the idle mix. The more it is screwed in (clockwise), the leaner the idle mixture. 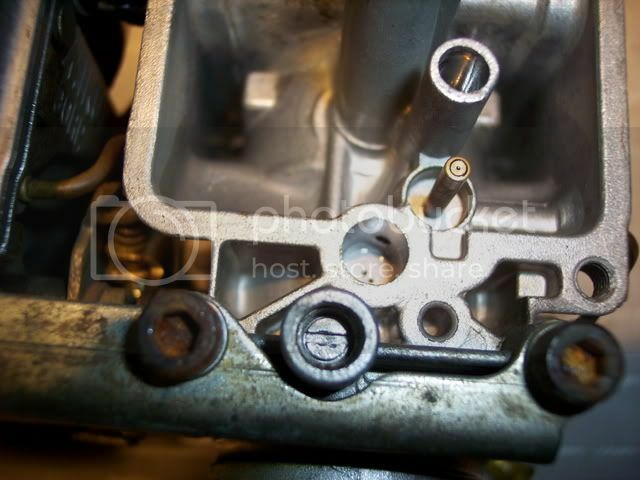 The pilot air jets that screw into the mouth of the carb (airbox side) are easy to crossthread so just be careful. Float - Once all the jets are in, its time to put the float on. I put some clean motor oil on my finger and lightly coat the o-rings. The oil will help the float "snap" into place and will prevent you from breaking the float from forcing it into place. 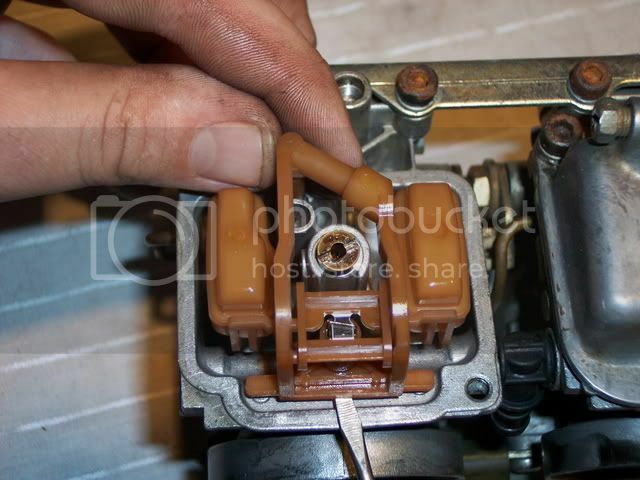 The 0-rings are what holds the float assembly to the carb. It is an interference fit. After putting the float assembly on, lightly pull up on each end of the float where the o-rings hold it. 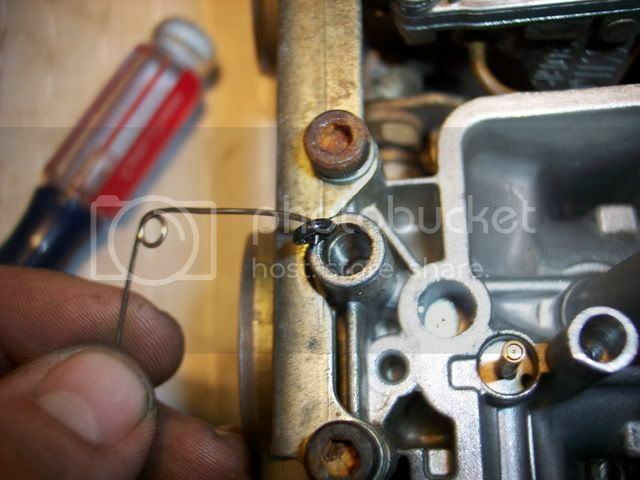 If you can easily pull the float back off the carb, the o-rings are no good and need to be replaced. Setting Float Height - Now that the carbs are pretty much all back together and the float assemblys are on you need to set float height. The carbs should be leaning at an angle so that the float tang (metal tab that rides on the needle) is touching the needle but not compressing it. I myself pick the float up off the needle and then set it down gently to make sure the needle wasnt compressed to begin with. Now you need to know what the float height spec is. You can refer to the specs in the beginning of this sticky or look in your repair manual. The spec will be in millimeters. If using vernier calipers you will need to convert millimeters to inches. You can use this webpage to do your conversion, http://www.sciencemadesimple.net/length.php. To adjust the float height you will need to bend the float tang either up or down. The float tang is the piece of metal that the needle clips to on the float assembly. Bending it up will decrease the float height, bending it down will have the opposite affect. One thing to mention that i have seen is that not all float tanks are the same height. What i mean by this is on one float assembly , one float tank may be higher than the other one. When setting float height you will want to set it on the float tank that is highest. I should have taken a picture to demonstrate this but i didnt think of it until after i had the carbs back on my bike. NOTE- Its called setting the float height but your actually setting the fuel level. 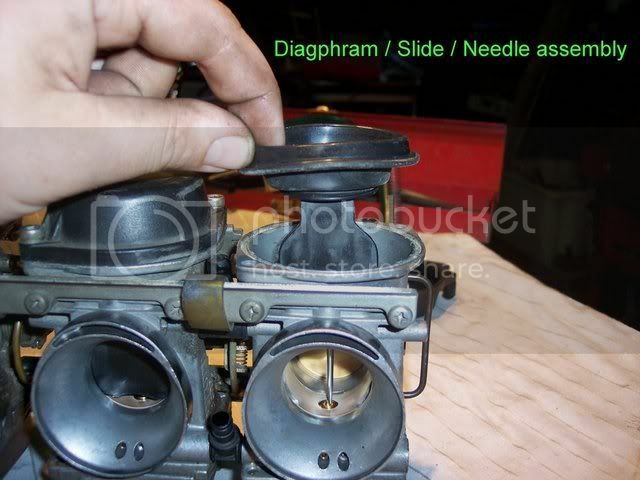 Picture the carbs installed on the bike, the higher the float is, the higher the fuel level is in the bowl. The higher the fuel level the richer the air/fuel mix. The lower the fuel level, the leaner the air/fuel mix. The reason for this is, the closer the fuel is to the venturi (emulsion tube and needle) the easier it is for the vaccum to pick up the fuel. The farther away the fuel is, the more vaccum (higher rpm) you will need to pick up the fuel. Last edited by Old Skool_R; 09-23-2007 at 08:40 PM. Excellent write up my friend. We all really appreciate the effort that went into it. FRUITLOOPS CRC Carb Cleaner will basicly junk your gaskets/orings - Beware. Diaphragms will shrink back down though. Thank you, thank you, i hope it helps people out. As far as the bench synch goes, its just a starting point. Many things can affect the synchronization of the carbs; varying compression between cylinders, valve adjustment, vaccum leaks, pilot screw settings, etc. Some have a bigger effect than others, and any of these may be why your bench synching doesnt work well. Bench synching is more or less so that when you put the carbs back on, the engine will run good enough for you to do a final synch. with a manometer. I think i said it in the sticky but yes, ALWAYS look on the back of the carb cleaner you're using. If it doesnt say if its safe for plastic/rubber. DO NOT USE IT. Last edited by Old Skool_R; 09-05-2007 at 08:10 PM. re: the bench synch - totally, absolutely agree with everything u said there. My best results were achieved by eyeballing rather than measuring - lining all butterflies up with the first hole on carb throat. I couldn't get a good result by physically measuring due to (a very small amount of) play in the linkages. Either way as u said, even my worst result, which was my last, resulted in the bike running well enough to get the manometer on it. Yes u did mention the carb cleaner issue. Thought I'd add a special mention for Fruitloops since he is in NZ and the only stuff I know we can get here is the CRC stuff. Last edited by Old Skool_R; 09-07-2007 at 04:10 PM. Here are some pics i had left over, might help. 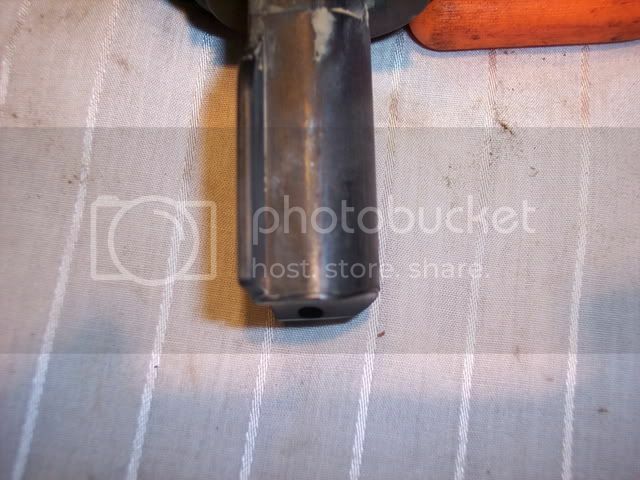 shot of the slide from the bottom, the middle hole is where the needle goes, the two outer holes are where the air flows out to raise the slide. These are the holes you would drill/plug/modify on some jet kits. Side shot of the slide. The shape of the bottom of the slide is where the carbs get the "slingshot" term. ozcru and kiwisuzuki1100 like this. Last edited by Old Skool_R; 09-07-2007 at 04:11 PM. FFS seriously? I read this just after i've completely pulled the carbs down and used CRC Clean-R-Carbs The gaskets/o-rings seem ok, and it's the next day now. You telling me they're going to disintegrate now? I'll post some pictures of why you want hex bolts and not the default screws too, took me hours to get mine out since I didn't have a drill handy to remove them..
Last edited by FruitLooPs; 09-09-2007 at 06:31 PM.